With the growth of the field of genetics, we are led to believe that our genes control our lives…that we are victims to our genes. The field of epigenetics, however, says that the opposite is true – we are not victims, but masters. Our perceptions and responses to our environment are what influences our genes, i.e. turning some genes “on” and others “off.” We are masters because we have control over our genes through changing our perceptions and/ or environments. Lipton was a witness to epigenetics while conducting stem cell research. He reports that all cells in his study were initially genetically identical, but when they were placed in different environments they became different types of cells (i.e. skin cells, lung cells, etc.). 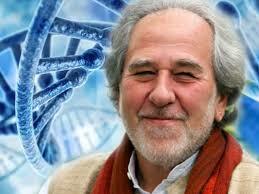 Lipton states that we as humans are a community of 50 trillion cells. Our blood is the culture medium in which the chemical composition of our blood determines the fate of our cells. Our brain determines the chemical composition of our blood. Our mind (our perceptions, interpretation of the world, and beliefs) determines the types of chemicals that are released by our brains. Our feelings of love release hormones that make our cells grow, while our feelings of fear release hormones that make cells close down. Lipton believes that the nocebo effect has just as strong of an influence on our bodies as the placebo effect. In the nocebo effect, our negative thoughts have negative effects on our bodies. These negative effects are the causes of our illness. While in the placebo effect, our positive thoughts have positive effects on our bodies. These positive effects lead us to health and happiness. These effects on our bodies are the result of our thoughts and feelings impacting the type of chemicals that are released by our brains into our blood streams. We learn as children that a doctor takes care of us when we are sick. We have given our power away and put it into the hands of the doctors. By doing this, we have then believed the doctor’s beliefs regarding our illnesses. This results in certain types of chemicals being released by our brains into our blood streams, which then affect our cells. Lipton believes negative doctor prognoses to be the cause of diatrogenic illnesses, or illnesses that are caused by treatment for a different illness. He reports that diatrogenic illnesses are the 3rd leading cause of death in the United States. Lipton, however, asserts that these illnesses are the number 1 leading cause of death after a reexamination. Lipton also explains that we have all been programmed at a subconscious level by our parents, family and community. Our life programs developed from our last trimester in utero until the age of 7. During our wakeful hours, 95% of our subconscious minds and only 5% of our conscious minds are in operation. Our subconscious is, therefore, running life for us using our programming when we are not paying attention. Therefore, our lives are the manifestations of our programs and not our deepest desires. This is not at all ideal as much of this programming is disempowering, limiting and self sabotaging. We should strive for our subconscious and conscious minds to have the same wishes and desires. Lipton calls this “the honeymoon” and says that these changes can be shown via brain activity. One machine that measures brain waves is the magnetoencephalography. It reads brain waves without even touching one’s head! Lipton uses this fact to support the idea that the energy we send out of our brains we bring back in, the phenomenon known as harmonic resonance. We create this energy with your perceptions, thoughts and beliefs, and have the power to change it.